Firstly I must stress I'm an historian, not a qualified herbalist. The remedies below are ones I've come across in my research into Medieval and Tudor medicine, some are outrageous and probably have their origins in the belief of magic, or sheer desperation; others have a lot of common sense behind them; and some I still use today. 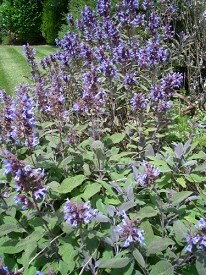 Sage can be used safely as a gargle for sore throats and a mouthwash for ulcers and inflamed gums. Put 2-3 sage leaves into a mug, add boiling water, leave for a few minutes, strain (just like making a cuppa!) and set aside to cool. Gargle with this antispetic liquid to relieve a sore throat, and help heal mouth ulcers. In Medieval times it was also used like our toothbrush of today. Leaves were rub across teeth to clean them and freshen the breath. In Medieval and Tudor times comfrey was known as "knitbone". If someone had broken a bone, in say their arm, then comfrey root was taken and pounded to a pulp. This was then put around the limb with the broken bone, just like plaster of paris today; it would have hardened, giving stability and protection whilst the bone knitted together. Research today shows that there are chemicals present within comfrey which may aid the healing and knitting together of bone. 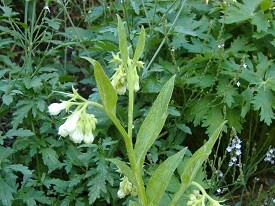 The leaves of the comfrey were also used in an ointment for small wounds, torn ligaments and joint pain. This is something I still make and use today. Pick fresh unblemished, young comfrey leaves, tear and put into a pot of olive oil (sweet almond oil is the best, but also the most expensive!) over a low heat and leave, apart from occasionally stirring, for four hours. Towards the end of this time melt some beeswax in another pot. The ratio to use is 600ml of oil to 50g of beeswax. Then add the beeswax to the oil, stirring; and as this mixture starts to cool pour into sterilised glass jars and label. I doubt whether all but the richest of Tudors used olive oil, and the poorest probably used an animal fat. In autumn, when the marshmallow plant is dying down, dig up part of the root, wash and clean it, and chop it up into small cubes. Place this in a large jug and cover with cold, boiled water and leave to stand overnight. The next morning you should find a slightly "gloopy" liquid, strain out the root and place the liquid in a saucepan, add sugar, reheat till the sugar dissolves, then bottle. Quanties to use are 120g (4oz) of fresh root or 60g (2oz) of dried root, 900ml (14 fl oz) of water. Then add 2g of sugar to each ml of liquid left. The root contains mucilage, so this syrup is good for soothing the digestive tract, and is a very good, pleasant tasting cough mixture for adults and children. It was this root candied that gave us the first marshmallow sweets - worth trying! Thank you for this information, I give talks on Pot Pourri used in Tudor times and this will help.